This resource features the general description of a logging town named Cobyr Square. 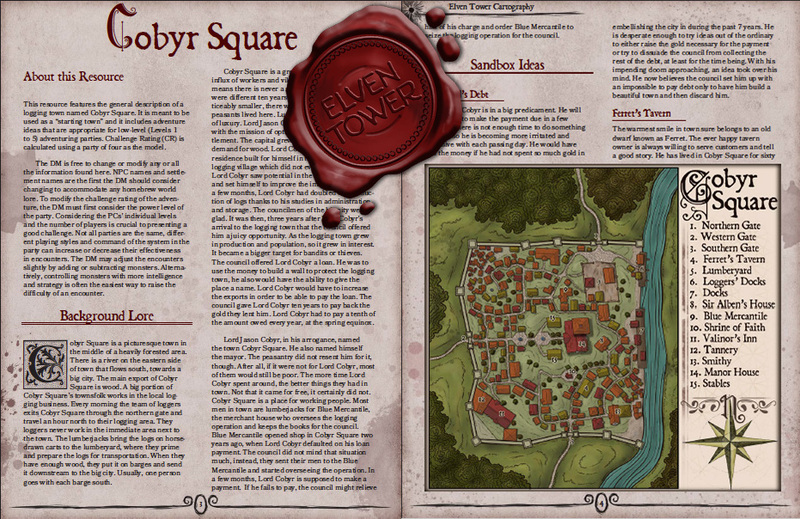 It is meant to be used as a “starting town” and it includes adventure ideas that are appropriate for low-level (Levels 1 to 5) adventuring parties. Challenge Rating (CR) is calculated using a party of four as the model. Cobyr Square is a picturesque town in the middle of a heavily forested area. There is a river on the eastern side of town that flows south, towards a big city. The main export of Cobyr Square is wood. A big portion of Cobyr Square’s townsfolk works in the local logging business. Every morning the team of loggers exits Cobyr Square through the northern gate and travel an hour north to their logging area. They loggers never work in the immediate area next to the town. The lumberjacks bring the logs on horse-drawn carts to the lumberyard, where they prime and prepare the logs for transportation. When they have enough wood, they put it on barges and send it downstream to the big city. Usually, one person goes with each barge south. Cobyr Square is a growing settlement. The influx of workers and villagers in the past few years means there is never a shortage of workers. Things were different ten years ago. The town was noticeably smaller, there was no wall, and only poor peasants lived here. Lumberjacks do not enjoy a life of luxury. Lord Jason Cobyr arrived one summer with the mission of optimizing the work in the settlement. The capital grew fast and there was high demand for wood. Lord Cobyr has a manor house residence built for himself in the center of the small logging village which did not even had a name yet. Lord Cobyr saw potential in the small settlement and set himself to improve the image of it. Within a few months, Lord Cobyr had doubled the production of logs thanks to his studies in administration and storage. The councilmen of the big city were glad. It was then, three years after Lord Cobyr’s arrival to the logging town that the council offered him a juicy opportunity. As the logging town grew in production and population, so it grew in interest. It became a bigger target for bandits or thieves. The council offered Lord Cobyr a loan. He was to use the money to build a wall to protect the logging town, he also would have the ability to give the place a name. Lord Cobyr would have to increase the exports in order to be able to pay the loan. The council gave Lord Cobyr ten years to pay back the gold they lent him. Lord Cobyr had to pay a tenth of the amount owed every year, at the spring equinox. 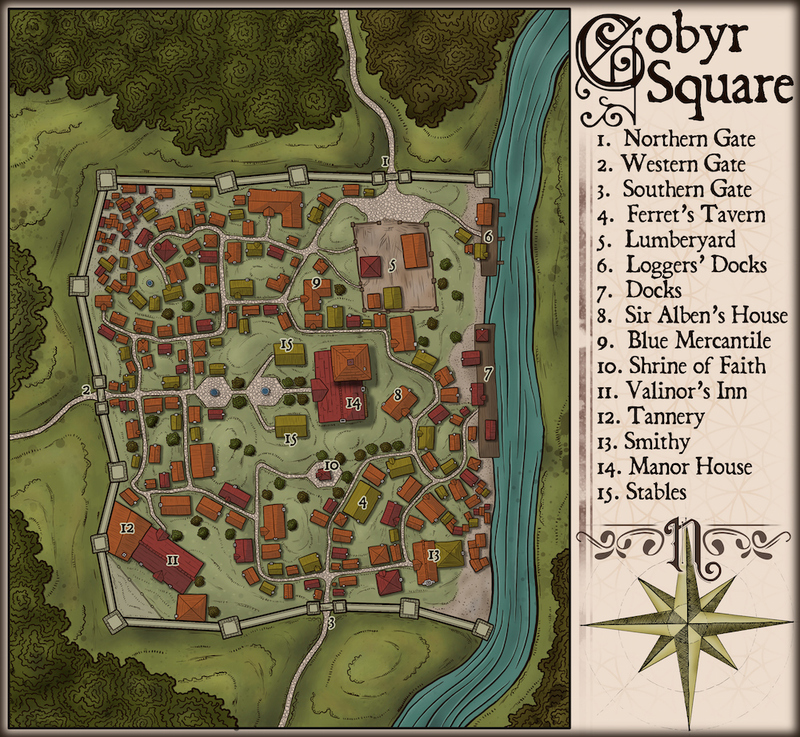 Lord Jason Cobyr, in his arrogance, named the town Cobyr Square. He also named himself the mayor. The peasantry did not resent him for it, though. After all, if it were not for Lord Cobyr, most of them would still be poor. The more time Lord Cobyr spent around, the better things they had in town. Not that it came for free, it certainly did not. Cobyr Square is a place for working people. Most men in town are lumberjacks for Blue Mercantile, the merchant house who oversees the logging operation and keeps the books for the council. Blue Mercantile opened shop in Cobyr Square two years ago, when Lord Cobyr defaulted on his loan payment. The council did not mind that situation much, instead, they sent their men to the Blue Mercantile and started overseeing the operation. In a few months, Lord Cobyr is supposed to make a payment. If he fails to pay, the council might relieve him of his charge and order Blue Mercantile to seize the logging operation for the council. Lord Jason Cobyr is in a big predicament. He will not be able to make the payment due in a few months. There is not enough time to do something about it, so he is becoming more irritated and explosive with each passing day. He would have had the money if he had not spent so much gold in embellishing the city in during the past 7 years. He is desperate enough to try ideas out of the ordinary to either raise the gold necessary for the payment or try to dissuade the council from collecting the rest of the debt, at least for the time being. With his impending doom approaching, an idea took over his mind. He now believes the council set him up with an impossible to pay debt only to have him build a beautiful town and then discard him. The warmest smile in town sure belongs to an old dwarf known as Ferret. The ever happy tavern owner is always willing to serve customers and tell a good story. He has lived in Cobyr Square for sixty years, running the tavern. In fact, Ferret was one of the original settlers of the logging town, back when it was nothing but a group of lumberjacks setting up camp for work. Ferret is good friends with Lord Cobyr and knows of his worries. Three years ago, Lord Cobyr received a letter from the big city. A retired knight named Sir Alben Dennu had been granted a lot of land in Cobyr Square as a reward for a life of service. Lord Cobyr granted him a good spot next to the manor house in the central part of town. Sir Alben Dennu spent his life as a guard of the royal family and has moderate renown in the kingdom. Sir Alben recently received a letter from a grandchild who lives in a town to the west. The town is currently under the control of bandits who killed the nobles and replaced them. No other settlement is aware because all letters are read by the bandit in charge. Sir Alben is willing to return from retirement to help his grandson and the townsfolk. He will not go alone, though. He is looking for strong men to accompany him and free the town. He cannot pay much but a good word from him might help secure a favor with the high nobility and even influence the king to award a knighthood to someone who is worth it. Goronno Adulari is the Master of Trade in the Blue Mercantile branch in Cobyr Square. Blue Mercantile is the name of a guild of traders. This guild works closely with the council and the crown. Blue Mercantile oversees and taxes merchants and traders as they come and go about their business in the kingdom. They way they work is this: When a merchant arrives at any settlement to work, they are required to submit an inventory of their wares to Blue Mercantile. The merchant house can then monitor how much gold they earn and tax them accordingly. Merchants and traders have many tricks to avoid paying much or to declare smaller inventories than they actually have, however. Gorono Adulari was sent here to oversee the logging operation. During his stay, he has reported that the production is good and steady. From his observations, Lord Cobyr should be able to pay his dues. Gorono actually hopes the lord is not able to pay. There is a good chance that if Lord Cobyr cannot comply, Gorono will replace him as the lord of Cobyr Square. Since this situation is known to both parts, Lord Cobyr and Gorono Adulari do not have a good relationship and mostly ignore each other, for the time being. The only inn in town usually serves merchants and passing traders. The owner is a half-elf named Valinor. The inn is a two-story building with eight rooms for rent. Valinor partnered with Ferret and started brewing ale and wine. There is a big basement under the inn that Valinor refitted to be a wine cellar. The cellar is packed with wine bottle stacks on the walls and barrels of ale brewing. Ferret and Valinor share the products they create and sell it in their establishments. There was a robbery at the inn last night. Whoever broke and entered, his only intention was to reach the wine cellar and steal the oldest vintage bottles. The thieves stole over thirty bottles. Valinor is currently offering a bag of gold coins to whoever helps retrieve the bottles and discipline the burglars. The bottles are currently in a big crate in the docks. The two thieves are planning to ferry the box south in a barge and retrieve it again in the capital. There is a big building on the southeastern side of town. This is the smithy and house of Yaal Turanni, a female half-elf with golden hair. Yaal is a smith, her work is applauded throughout the kingdom. Such is her craftsmanship. Yaal is currently overbooked with scores of weapons and armors for this or that lord. She recently finished an adamantine ornated longsword for the king himself. Anyone can see that the sword is exquisite in its construction, balance, and beauty, but the king had a special request for his royal weapon. A specific type of creature had to die by the sword’s edge. Only after the sword was bathed with the blood of such enemy, would the king concede the work finished, and accept the sword for his own use. The DM is free to determine what creature must be killed with the sword. This decision is dependent on the average party level. For low levels, creatures such as trolls, ogres, and owlbears are good suggestions. For higher level parties, a dragon, a strong undead, or a demon is a great suggestion. In order for the party to accomplish this quest, Yaal must trust the party enough to give them the sword so that they can use it to slay such monster. She may also point the party in the direction of such creature’s lair.